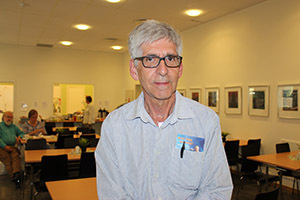 SLEEPING WELL: Herleiv Hansen (71) from Råde is now able to sleep well after both the sleep apnea and acid reflux disappeared after receiving prayer at a miracle meeting on June 14, 2014. In addition, he was saved. -I felt that I had nothing to lose by getting saved, says Herleiv Hansen (71) from Råde in Østfold, Norway. On June 14, 2014 he attended a miracle meeting and was one of several who accepted Jesus. -When I was young I grew up in a Christian home and have been a religious man, but have never practiced the faith, but now I accepted Jesus, he says is happily. Hansen also came to the meeting with several sicknesses and received prayer from Svein-Magne Pedersen. In the days after the meeting Herleiv experienced that something had happened with his body. For several years he had struggled with so-called sleep apnea that can be felt by getting repeated stops in the nightly breathing. Many who are struggling with this, have ten second stops in their breathing several times an hour. This ailment can develop into various diseases, and many wake up poorly rested. -I did not notice this much when I was sleeping, but my wife did. Sometimes I would wake up, and it was uncomfortable. The sad part was that I did not get proper rest when I slept, and I had less energy. After receiving prayer Herleiv has slept like a rock. -Now my wife doesn't need to nudge me asking me to breathe. I sleep well and I wake up feeling rested. It's a new life. Herleiv also struggled with another problem that had ramifications for his sleep. For about two years, he had suffered with reflux (relaxed sphincter muscle), which led to acid reflux and heartburn at night. He therefore had to avoid lying flat by building up the bed, and sleeping with two pillows. -Now I do not notice anything to the problem. I now sleep completely flat with a regular pillow, he says happily. Herleiv says he also experienced a miracle in the 90s when Pedersen prayed for the sick in Sundby in Saltdalen. For several years he had suffered from tinnitus. -I do not know how I got tinnitus, because I have never exposed my ears to loud noises. The tinnitus was a loud, buzzing sound, which at times was troublesome. When Pedersen prayed, the tinnitus disappeared, and it has been gone ever since. It was a good experience, he concludes.